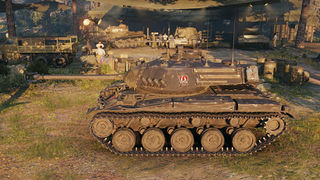 The leKpz M 41 90 mm GF is a German tier 8 premium light tank. German variant of the M41A1 Walker Bulldog U.S. light tank. The changes mainly related to the 76 mm M32 gun, which was re-bored to 90 mm and shortened by 425 mm. However, this tank does have its limitations as your HEP shell will almost never work against the better armored light tanks. You can also count out any chance of a random bounce here and there, as it has a max of 25mm of armor and if you're fighting anything with good HE rounds you're better off staying side-on and hoping your tracks block their HE shell. A viable strategy when using the M41 GF is to initially load your HEP shell and do some aggressive active spotting to farm some initial spots and spotting damage. Then adapt to more of a flanking medium, spotting where needed and working to ensure your team maintains vision and health superiority. 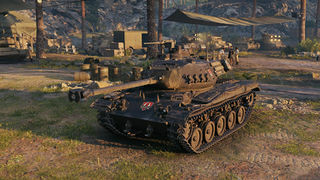 With patch 9.18 the non-premium American M41 Walker Bulldog has been moved up to tier 8, while at the same time having its auto-loading gun nerfed. 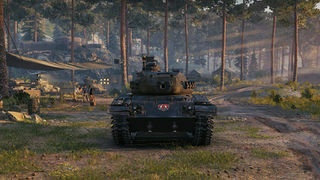 As a result, the M 41 90 was better in some aspects such as penetration on both standard and premium ammunition and DPM but is severely outclassed in terms of mobility. Additionally, the M41 Walker Bulldog got 2 more degrees of gun depression when using the single-shot guns. After the series of 9.20 patches, the competing M41 has lost its autoloader altogether. As it stands, DPM, pen, alpha damage, aim time, top speed and total HP are better for M 41 90 while shell velocity, gun handling, gun depression, power-to-weight, mobility and some lesser aspects are better for M41. This page was last modified on 8 February 2019, at 20:32. This page has been accessed 75,218 times.